When it comes to specialty papers there’s nothing quite as special as Moab Moenkopi Washi. There’s no way to describe the beauty of this paper made using traditional Japanese methods from mulberry and hemp fibers. Pictures on the web do it no justice either. One has to experience its subtle properties in person. The lightest version available is called Unryu. Unryu has a translucency that showcase the thick random fibers the paper is composed of. While beautiful it can be tricky to use for photographic prints. It’s possibly the fine art paper most dependent on artistically matching the right image with this paper’s unique properties. The key to using Unryu effectively is two-fold. First is the size of the visible fibers in relation to the size of major image details. The second is negative space, white space, and large even-toned areas within the image. In other words the space in your photograph that has little or no other detail is ciritical. It’s this space that takes on a life entirely influenced by the paper itself rather than what is contained in the photo. One realization that may not be immediately obvious is that the size of those fibers embedded within Unryu are fixed, they don’t change no matter what size print is made. The size of the details contained in a photograph do change depending on the size of the print. What may work well in a smaller print with this unique paper may not work well with a larger print. The same is true of the opposite. A particular image that is not optimal printed on Unryu in a small size may look magnificent printed large. A few rules of thumb are helpful when starting to explore specialty papers like Unryu that are highly textured, where the texture itself becomes a large part of the overall presentation. You may have already guessed the easiest images to match up and look great on Unryu are photos with large areas of no important image detail at all. In many cases those are the kind of images most likely to look good at smaller and larger print sizes. Generally speaking images with large amounts of fine details will be overwhelmed by the texture as the visible fibers are quite large (between 1” to 2” long and 1⁄16” in thickness). 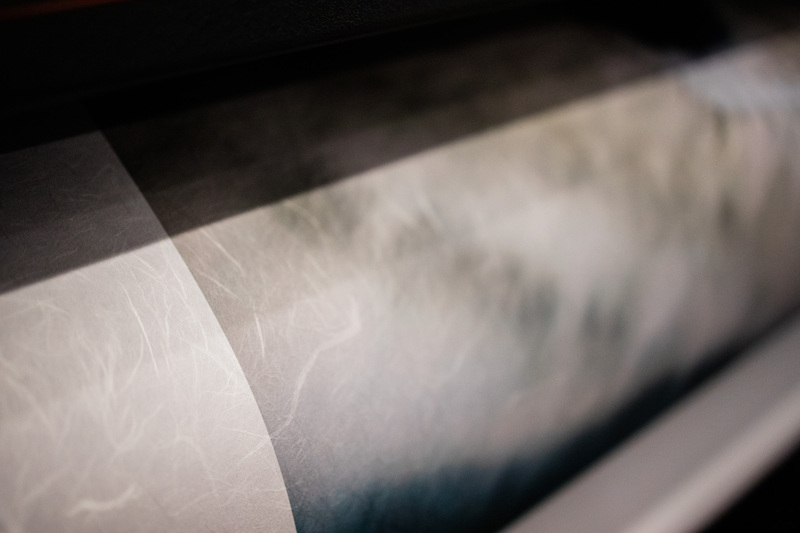 When considering image detail and taking into account that the texture and fibers within the paper are of fixed size you will probably want to avoid a print size where the fibers are similar in size to important image detail. Certain images with a lot of detail may work where the texture is much larger or smaller than important detail. The bottom line is to take into consideration the actual image size on the paper. Images with a large amount of detail throughout the image are probably more compatible in large print sizes. Images with a simple composition, one main subject, and a lot of empty space surrounding that subject usually shine when printed on Unryu. This particular example of a tree branch with empty sky works well in very small print sizes (5”x7”) all the way up to huge sizes, 44” wide. If you have not gone back and looked through your library of images in a long time or have only looked at your previous favorites do it with Unryu in mind as a primary consideration. Actively seek out photographs that you’ve passed over previously with a fresh perspective. Look for images that have a lot of blank featureless areas. Those images can be pure magic on Unryu. This colorful image of a coyote is an illustration of a photograph with a relatively large amount of fine detail that covers all of the frame. This particular image does not work well at print sizes smaller than 24”x36”. On the other hand it looks fantastic and possibly our favorite rendition when printed very large. With this image the size of those gorgeous fibers in Unryu and how they interact with the coyote’s fur have everything to do with the overall print appearance. At a certain threshold of image scale it starts to look great. You may ask how would one know… In this case it was an educated guess more than any rule of thumb or hard and fast rule. Part of that educated guess was though experience working with the material. The other part was taking a little bit of a risk. You can minimize that risk by scaling the image size up and printing a small section on a moderately sized piece of Unryu to get, at minimum, an impression of areas of detail you consider critical. One last tip when working with papers that have a lot of their own texture and personality. Show the paper off. Leave larger borders than you usually would. Take a look at the borders we’ve left on this print of the coyote. We have no plans on trimming them or covering them up. Instead they will be on display and part of the overall presentation. With a paper this attractive a mat may actually detract from the overall presentation.